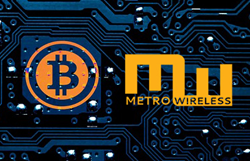 Metro Wireless is one of the first business ISP’s in the country to accept cryptocurrencies in exchange for services. Metro Wireless, a metro Detroit based business Internet Service Provider (ISP) with customers nationwide announced Monday immediate ability for customers to pay for services with Bitcoin (BTC) and Bitcoin Cash (BCH) cryptocurrencies. This latest move enables customers to use virtually any Payment Protocol compatible (also known as BIP-70) cryptocurrency wallet to complete a transaction. Metro Wireless is now one of the first business ISP’s in the country to accept cryptocurrencies in exchange for services. Metro Wireless, a metro Detroit based business Internet Service Provider (ISP) with customers nationwide announced Monday immediate ability for customers to pay for company services with Bitcoin (BTC) and Bitcoin Cash (BCH) cryptocurrencies. This latest move enables customers to use virtually any Payment Protocol compatible (also known as BIP-70) cryptocurrency wallet to complete a transaction. Metro Wireless is now one of the first business ISP’s in the country to accept cryptocurrencies in exchange for services. Effective immediately, customers will be able to choose the Bitcoin payment method from the company user portal and begin completing transactions in popular cryptocurrencies. The company has selected BitPay.com, a popular merchant processing company to partner with and has successfully integrated the platform into its own user experience. Since its inception in 2013, Metro Wireless has established itself as providing cost-effective business Internet services and related products nationally across all states. These new forms of digital currency payments, beyond the traditional check, ACH or credit card transactions, can be used to make payments for business Internet services, equipment purchases, site build outs and business Internet installations. Metro Wireless CEO, Dominic Serra, explains that “leading a technology company, I have to pave the way for new and incoming changes in monetary exchanges, offering our customers the latest and greatest offerings.” Serra believes that the future of payments is shifting quickly and thinks we have to evolve with the times. Other companies Metro Wireless is joining in cryptocurrency transactions are Overstock, Microsoft, Expedia, and Whole Foods, amongst many others. Today, Bitcoin and other cryptocurrencies are growing at an ever-increasing rate, becoming a global phenomenon known to almost all people. Cryptocurrencies can be viewed as a solution to many obstacles that the traditional financial system has. To help make financial transactions fast, secure and at low cost, cryptocurrencies come in handy because sending money to different parts of the world in a traditional way can be expensive, sometimes delayed and risky. Metro Wireless believes that more companies will be joining them in accepting new forms of digital payments in the coming months. Being seen as the next evolution of currency, cryptocurrency prides itself in its cost-effectiveness, decentralization and convenience. Being an emerging technology, we can say that Bitcoins have the complete potential of changing and improving commerce as we know it. We can rightly conclude that the early adoption of this technology for a minimal cost is an excellent move for businesses and buyers alike. Metro Wireless, a metro Detroit based business Internet Service Provider (ISP), offers temporary, permanent and backup services including fixed wireless, fiber, LTE, P2P, SD-WAN, colocation, managed WIFI and hosted PBX nationwide.